New York: Basic Books, 1988. Hardcover. Small 4to. Blue cloth with gilt spine lettering, pictorial dust jacket. x, 313pp. Tables, figures. Fine/near fine. Superb and tight first edition , boldly inscribed and signed by the author in black ballpoint on front flyleaf: "To Bob Malott / In friendship and / with hope that you get / a charge out of this book. / Murray Weidenbaum." Weidenbaum (1927-2014) was a noted American economist and author, while Robert Malott (1926-2018) was a noted Chicago business leader, CEO of FMC Corporation, Republican politico and philanthropist. New York: The Newcomen Society in North America, 1979. Paperback. 8vo. Stiff tan wrappers. 24pp. Illustrations. Near fine. First edition. The Newcomen Society was a distinguished honorary society, formed in England, devoted to the study of "those factors which have contributed or are contributing to the progress of Mankind" -- usually business, industry, transportation, agriculture, etc. New York: Carlton Press, 1975. Hardcover. 8vo. Red cloth with black spine lettering, pictorial dust jacket. 111pp. Fine/near fine. First edition, tight and attractive, of this humorous comparison of the business world to animals in a zoo. Front flyleaf is boldly inscribed and signed by the author in blue ballpoint "To Bob & Ibby Malott -- / who must answer themselves / the question 'Can the keeper of the / zoo also by an inmate?' / Tom Bamford / August 1979." Robert Malott (1926-2018) was a noted Chicago businessman, CEO of FMC Corporation, Republican politico and philanthropist. 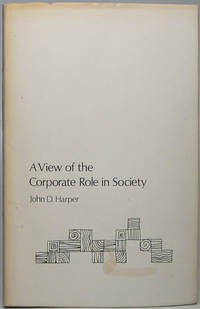 By PRESTOWITZ, Clyde V., Jr.
New York: Basic Books, Inc, 1988. Hardcover. Small 4to. Green cloth with gilt spine lettering, pictorial dust jacket. xvi, 365pp. Figures. Fine/fine. Superb, tight and pristine second printing of this study of how Japan got the better of American industry, with the U.S.'s help all the way. Boldly inscribed and signed by the author in black ballpoint on front flyleaf: "To Bob Malott, / With Warm Regards, / Cl;yde V. Prestowitz, Jr. / 7/12/88 / Chicago." From the library of Robert Malott (1926-2018), noted Chicago businessman, CEO of FMC Corporation, Republican politico and philanthropist. Minneapolis: Interface Publishing, 2006. Paperback. 8vo. Stiff glossy pictorial wrappers. xv, 108pp. Charts, tables. Fine. 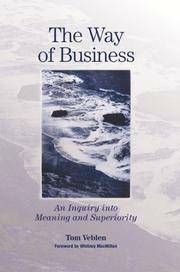 A pristine second printing of this business study by a direct descendant of economist and "conspicuous consumption" pioneer Thorstein Veblin (1857-1929), nicely inscribed and signed by him in black fineline on title page: "Press On, / Tom Veblen / July 2006." Laid in is a printed review and transmittal letter from noted Chicago-area healthcare business executive Wiley N. Caldwell (born 1927) sending this copy to "Bob," signed and with holograph postscript. "Bob" is Robert Malott (1926-2018, noted Chicago businessman, CEO of FMC Corporation, Republican politico and philanthropist. 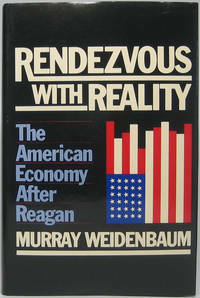 Pittsburgh: Carnegie-Mellon University Press, 1977. Hardcover. 8vo. Black cloth with gilt lettering and decoration, price-clipped dust jacket. 57pp. 2 illustrations, decorative endpapers. Near fine/very good. Jacket faintly edgeworn, with age toned spine and some discolored patches. A tight, nice first edition of the 1976 Benjamin F. Fairless Memorial Lecture, boldly inscribed and signed by Harper in black fineline on front flyleaf: "To Bob Malott / with all good wishes / John Harper." Harper (1910-85) was the long-time president and CEO of Alcoa (Aluminum Company of America). Robert Malott (1926-2018) was a noted Chicago businessman, CEO of FMC Corporation, Republican politico and philanthropist. New York: The Modern Library, n.y.. Hardcover. 12mo. 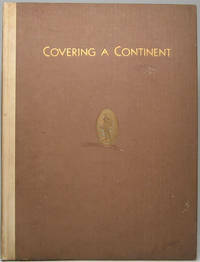 Grey cloth with gilt lettering, pictorial dust jacket. xi, 487pp, (8pp ads). Map frontispiece, 2 maps, grey decorative endpapers. Very good/very good. Faint jacket edgewear and some rubbing; small ownership signature on front pastedown and small red inkstamp on rear pastedown. This classic study was first published in 1911 and went through several editions before the first ML edition 1956; this tight and nice later printing of ML #207 dates to circa 1962. Chicago: The Albert Pick-Barth Companies, 1928. Hardcover. 4to. Tan cloth with black lettering and front board burgundy calf label with gilt lettering. 438pp. Extensive illustrations and floor plans. Very good. Faint binding wear only, else internally tight and fine. 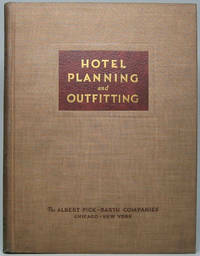 A superb, tight and handsome first edition of this highly detailed (to cite title page sub-subtitle) "Compilation of Authoritative Information on Problems of Hotel Economics, Architecture, Planning, Food Service Engineering, Furnishing and General Outfitting, Including Numerous Illustrations, Plans and Tables of Data." This lovely and unusual copy has been extra-illustrated with an added frontispiece: Tipped opposite title page is a Typed Letter Signed from Albert Pick Jr., 1p, 8½" X 11", Chicago, IL, 25 May 1965. Addressed to Kenneth N. Anglemire. Very good. On "Pick Hotels Corporation" letterhead, the firm president thanks the president of Marquis-Who's Who Inc. "for your telegram of invitation to attend the World's Fair on Wednesday, June 16. Unfortunately I have an important business engagement in California at the same time, and will not be able to be with you. Am sorry as undoubtedly your program would be a most enjoyable and interesting experience...." Boldly signed in full. (Anglemire was in charge of "Illinois Day" at the 1965 New York World's Fair.) Pick (1895-1977) was the namesake grandson of the founder of this once-thriving high-end hotel chain, and himself served during his long career as the hotel's treasurer, director, president and finally chairman of the board -- and ultimately its sole owner. New York: Architectural Catalog Co, 1942. Paperback. Folio. Stiff tan wrappers with black lettering. (21pp, rectos only), (12pp ads). Numerous illustrations. Very good. Faint wear to outer wrappers (only), else internally fine. A tight, handsome copy of the October 1942 issue (Vol. VI, No. 17) of this specialty monthly. Memphis: Memphis State University Press, 1978. Hardcover. Small 4to. Blue cloth with gilt spine lettering, pictorial dust jacket. xxi, 420pp. Very good/very good. Faintest of edgewear and mildest of jacket edgewear. A superb and tight first edition, handsomely inscribed and signed by the author in black fineline on front flyleaf: "To ----- / With friendly greetings / G.S. Boritt / October 13, 1978 / P.S. I would be pleased to have your / views on the book." Surprisingly scarce and seldom seen, especially signed. Chicago: Bodine Electric Company, n.y.. Hardcover. 8vo. Blue cloth, dust jacket. xiv, 334pp. Frontispiece, illustrations. Fine/very good. Some jacket edgewear and archivally-closed (on verso) edge tears. Unspecified "Limited Edition" second printing of this Chicago electronics company history -- not dated, but seemingly 1990s. London: Baring Bros. & Co, 1985. Hardcover. Small 4to. Burgundy cloth with gilt spine lettering, dust jacket. 93pp. Numerous illustrations, pictorial endpapers, foldout genealogical chart. Fine/near fine. A tight and pristine first edition of this history of the oldest merchant bank in London. Dubuque: W.A. Adams, 1857. Hardcover. 8vo. Original printed paper over boards with modern black cloth tape spine. Pp. 75-204, (1p). Advertisement endpapers. Good only. Boards quite edgeworn, scuffed and rubbed with rounded corners and rear board showing a mended horizontal crack; first couple leaves likewise edgeworn. A tight and decent first edition of this Iowa town's second city directory -- with a choice twist: From the collection of William B. Allison (1829-1908), influential Iowa politician and Republican who served that state in Congress as representative (1863-71) and long-time senator (1873-1908). Allison moved from Ohio to Dubuque the very year this title was published, where his older brother Matthew had an insurance and real estate business. William appears in this directory as "of Samuels, Cooley and A," Matthew as "real estate and ins ag't." Three large, exuberant and youthful ownership signatures appear in this book -- all three reading either "W. Allison" or "M. Allison," the large initial letter conceivably either alternative. All are atypical of the older politician's usual "W.B. Allison," as numerous exemplars bear out, but none are anywhere near this early and this difference alone could explain the atypical appearance. The signature on rear blank flyleaf is almost certainly that of Matthew, as the word "Agt." in the same hand follows -- as in insurance agent. The first signature, along the darkened top edge of the front board, also notes "149 Main [St]" afterward, and since Matthew's business address appears in this book as 79 Main Street, this too suggests a "W. Allison" interpretation. The front inner flyleaf bears a huge "W" or "M" Allison signature, followed by "DuBuque / Iowa." This rarely-seen old alternative spelling for Dubuque might suggest the spelling of a newcomer to town, as William Allison was at the time. The first 74 pages of this book, by the way, appear to have been intentionally removed, likely by an early owner, perhaps Allison himself, to omit all the introductory ancillary material and leave only the "meat" of the book -- the business directory that a downtown businessman such as Allison would be interested in. An intriguing Allison family copy, in any case, with a bit of unanswerable autograph mystery to it. Boston: Dutton and Wentworth, Printers, 1845. Paperback. 8vo. Orange wrappers. 31pp. Very good. Mild edgewear to wrappers. First edition, tight and nice. 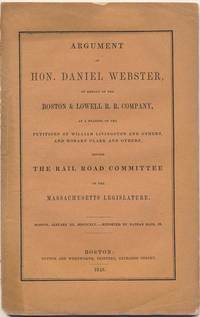 Lengthy and persuasive speech against a petition requesting incorporation of a new railroad line to run between Lowell and Andover, Massachusetts. Not in Sabin, but neither are most of this prolific pontificator's post-1840 public pronouncements. New York: Time, Inc, 1932. Paperback. Folio. Stiff color pictorial wrappers. 128pp. Numerous illustrations (many color), advertisements. Near fine. Faint edgewear. Perfectly tight and lovely copy of this early issue of the famed periodical, internally fine. Includes one article featuring Margaret Bourke-White photographs. 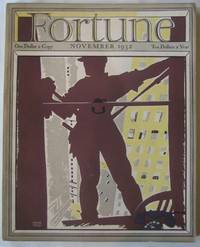 Fun stylized color cover illustration by Ervine Metzl in tans, browns and yellows depicts a silhouetted window washer at work on a highrise. 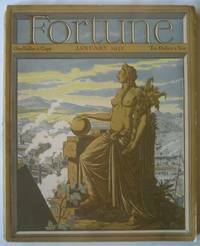 New York: Time, Inc, 1932. Paperback. Folio. Stiff color pictorial wrappers. 146pp. Numerous illustrations (many color), advertisements. Very good. Faintest of edgewear. Clean, tight, handsome copy of this early issue of the famed periodical, internally fine. 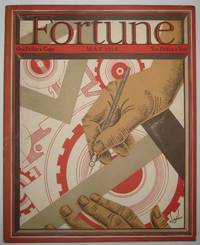 Wonderful color cover illustration by Constantin Alajalov depicts a closeup of two hands working with slide ruler and pen (reminiscent of Dutch artist M.C. Escher's famed "Drawing Hands") against a mechanical background of gears and cogs. New York: Time, Inc, 1932. Paperback. Folio. Stiff color pictorial wrappers. 112pp. Numerous illustrations (many color), advertisements. Very good. Faint edgewear. An exceptionally tight and quite handsome copy of this early issue of the famed periodical, internally fine. 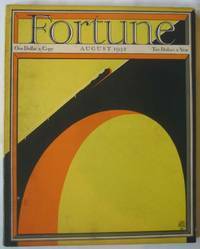 Includes one article featuring Margaret Bourke-White photographs. 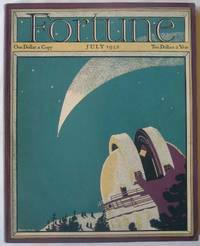 Outstanding color cover illustration by Ervine Metzl depicts a round-domed observatory at lower right, a comet streaking leftward across a deep green sky. New York: Time, Inc, 1932. Paperback. Folio. Stiff tan pictorial wrappers. 124pp. Numerous illustrations (many color), advertisements. Very good. Faintest of edgewear, with spine slightly cocked. Clean, tight, handsome copy of this early issue of the famed periodical, internally fine. Classy color cover illustration by T.M. Cleland shows a bare-breasted mythological-looking female in half-toga and clutching cornucopia astride ruins in the foreground looking out over a modern-looking cityscape with smoke-spewing factory smokestacks. New York: Time, Inc, 1932. Paperback. Folio. Stiff color pictorial wrappers. 100pp. Numerous illustrations (many color), advertisements. Very good. Faintest of edgewear. Clean, tight, handsome copy of this early issue of the famed periodical, internally fine. Superb stylized color cover illustration by Paolo Garretto depicts a train racing across a gigantic bridge against a yellow sky.